To see this thread with all of the the pictures and video links properly formatted please go here. I just don't have the patience to try and reformat this so they show and embed here also. 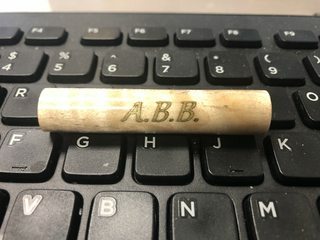 This is a followup on the "review I started a few weeks ago": on the use of the mini laser engravers that are now available. My main purpose for buying these is to engrave pens that I have turned so this is a review of using them for that application primarily. I now own and have used both the enclosed and open bottomed ones that are available. Both work well but I have found that they fill different niches. I spent a grand total of $150 including shipping so I'm ok with owning both. I also spent $6.99 on a web cam that I mounted in the top of the engraver so I'm not tempted to stare at the laser. Last edited by ramaroodle; 01-18-2019 at 01:10 AM. One question. Has anyone found a way to use one of these to engrave or etch on brass or nickle shell casings? No, they are not able to etch metal. Can you link to this open bottom version? I've never seen one of those but can already think of about 5 different projects/requests I couldn't do since the item didn't fit in the NEJE. That one in your pictures would have worked for all of them! The only one I've found on Amazon was out of stock. I tried searching the name of the one in your pictures but nothing came up. I suspect they are like the NEJE in that there is a stupid number of different "brand" names you can find them under. They are. Mine has no "brand" name at all. If looking at the open bottom ones I'd get the 2000mW version. Last edited by ramaroodle; 01-18-2019 at 11:51 AM. Some are working on it in a roundabout way. They apply some sort of etching resist and burn that away and then use standard etching fluids. But metal laughs at these mini lasers. There are youtube vids on applying some type of paste to metal or glass to etch but if that is your goal "these are not the droids you're looking for ". Seems that for me so far I’ve had the best luck with the metallic powder and CA. I use one coat of thin CA on the bare sanded blank before engraving. Then medium CA (the thin runs too easily) with the fine point nozzle put into engraved letters then put the powder on top of that and press it down with a paper towel. That seems to enfuse the powder and actually leaves a raised mound. (which looks like a blur at first but sands down to a very nice finish). Then I recover the excess and blow off the blank with compressed air and hand sand the lettering until it slowly reveals itself. This method holds up better than the Rub n buff or acrylic paint I think because powder is metallic, the CA is rock hard and bonds with the wood and powder. This combo is hard and elevated enough to withstand sanding. It also doesn’t have to dry overnight like the paint and RnB. Seems like hand sanding just the letters with 120 grit until they are back down to the level of the blank works best otherwise sanding on a spinning lathe sands the entire blank. Interestingly, having the burned wood as the substrate seems to give the lettering a delicate border around the letters. Then, just finish as always with 400 or 600 and CA. Last edited by ramaroodle; 01-26-2019 at 01:19 PM.